Chadwick Boseman is electrifying, Tate Taylor as a director momentarily touches greatness, but as a music bio it doesn’t get you hyped afterwards to go buy the music. 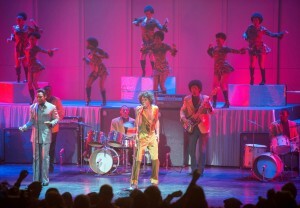 Get On Up has a first shot of Boseman strutting as James Brown on a way out to a concert (He’s the Man! ), followed by a dismaying scene of an older Brown, in 1988 Augustus, Georgia, threatening some people at a seminar with a shotgun. The oddness of this must be explained, and for the next two hours, the film drills us to why Brown went bonkers. There’s a great sampling of music and a few booming concert scenes, but the film somewhat short-changes the music in favor of a psychological chronicle. Much of this is brilliant, it’s not at all scattershot but rather excavating of how the man saw himself “chosen.” But we attend a Brown biopic to get as much out of we can in how he became hailed as the Godfather of Soul and the pioneer of funk. It gets across, but not ebulliently. What is over-emphasized is Brown’s temper, his crazy antics, his way of using and disposing friends. Boseman’s bravado is nearly unparalleled, however. Just as Val Kilmer nailed Jim Morrison in “The Doors” (1991) and Jamie Foxx internalized Ray Charles in “Ray” (2004), Boseman does for Brown. Without saying it, Brown was kind of a sociopath – he built relationships and partnerships, milked them for their worth, and then destroyed them – but we understand how he couldn’t have turned out any other way. After we have been with him for nearly two hours, Brown’s apex of fame is definitive, no, it’s declared, when he performs in Paris in 1971. What flaw comes next is inexplicable, for it skips the next 17 years of his life. We get one scene of drug use, and then cuts again to the gun incident and flee from the law in 1988. How does an audience come out of the film and not ask questions about what’s missing? No justice is made by the film as to how Bobby Byrd paved out a career for himself after he parted ways with Brown – you get the impression that he flamed out, but not so. 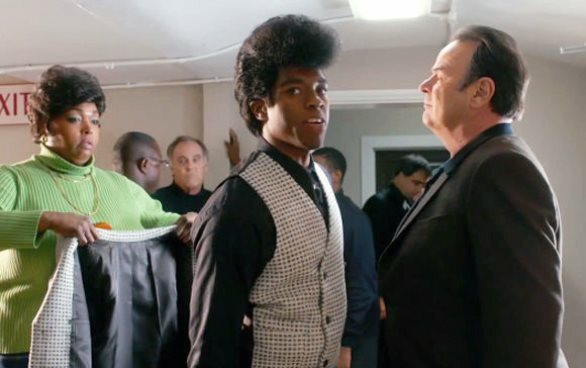 But what “Get On Up” does not finish up with is the power of music. The relative letdown is that “Dreamgirls” (2006), with Eddie Murphy channeling Marvin Gaye and James Brown in one, feels like it had more music that got played out in full tracks, than this Brown biopic. As a character study, however, Boseman is unforgettable, there are stirring images of racism that outdoes Taylor’s previous hit “The Help,” and… Boseman is (repeat!) unforgettable. Every chance he gets Boseman gets a lot of mileage out of the music and dance scenes, I just wish the film’s tone was celebratory and not a lament. Film Cousins: “What’s Love Got to Do With It?” (1993); “The Doors” (1991); “Ray” (2004); “Dreamgirls” (2006).